A reader recently sent us a photo and wrote, “I saw a lot of these in our kitchen drawer but didn’t see them anywhere else. I finally discovered 5 of them in a small measuring cup. When I removed all of the utensils in the drawer to clean them, there were dozens of them that appeared to be dead (none were moving.) 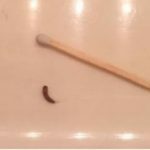 I dumped the larvae outside and cleaned out the drawer and submerged all of the utensils in boiling water for about 10 seconds to sanitize them.” He is curious about what the larvae are, if they are harmful, and if boiling water is an effective method for cleaning the utensils. The photograph shows 3 light brown larvae. Their bodies are lined with distinct segmentation, but we don’t notice any other appendages. 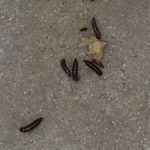 We are confident that these are carpet beetle larvae, which are some of the most common worm-like organisms that we write about here at All About Worms. 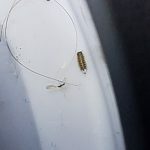 Carpet beetle larvae are found by readers in all different areas of their homes because they have such a wide range of potential food sources. They are known to eat carpeting, upholstered furniture, wool, feathers, felt, fur, pet hair, linens, fabrics, dried food products, pet food, and other various small particles. We aren’t sure what the carpet beetle larvae our reader found were eating, but since he thoroughly cleaned out the drawer where he found them, we think he has probably successfully eliminated the food source. 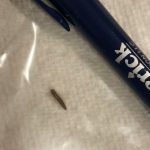 To be on the cautious side, he might want to check the other drawers and cabinets in case there are more carpet beetle larvae in other locations. Any area that has been disturbed should be cleaned out. 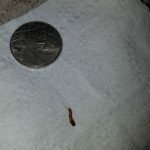 The best way to get rid of carpet beetle larvae and to keep them from coming back is to keep up a cleaning regime of sweeping, doing laundry, dusting, and vacuuming. 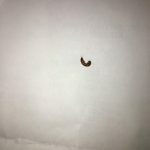 All of these activities will help limit the number of potential food sources lying around for carpet beetle larvae to eat. As for cleaning the utensils, dipping them in boiling water should be just fine. 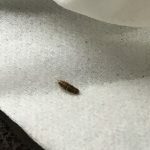 Since carpet beetle larvae aren’t known to be harmful from a health perspective, the bigger issue is just getting rid of them before they destroy household materials. 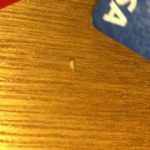 In summary, a reader discovered some carpet beetle larvae in a drawer in his kitchen. Since this is the only place he found the larvae and he effectively cleaned it, we don’t think he has anything to worry about! 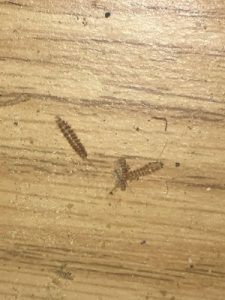 A reader discovered some carpet beetle larvae in a drawer in his kitchen. Since this is the only place he found the larvae and he effectively cleaned it, we don't think he has anything to worry about!